This is a quick and easy dish that you can make the night before and just quickly grill the next day. Goes well over rice or just eat is. Leftovers taste great in a salad. In a bowl, whisk the lemon juice, olive oil, spices and garlic. Add your cut up pieces of chicken into a large ziplock bag. Add your chopped up vegetables in another large ziplock bag. Divide your marinade between the two bags. If you need more in one bag than the other, do so accordingly to make sure all the chicken and veggies are coated. Refrigerate overnight. You can also do this in the morning and refrigerate all day. Regardless marinade for at least 4 hours. 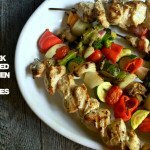 When ready to grill, discard excess marinade and skewer your chicken and vegetables. Grill until the chicken is done. Enjoy!